At Zambeza, we have unveiled our most potent CBD oil yet with a 10% CBD concentration. Never compromising quality, Zambeza Seeds CBD oils maintain complete purity from bottle to bottle. We take great measures to retain as many cannabinoids from the original hemp plants as possible, removing only harmful additives, chemicals, and other contaminants that detract from the overall effectiveness of this beneficial dietary supplement. Furthermore, our 10% CBD oil is free of any psychoactive content, so you can take it anytime, anyplace. While offering customers one of the highest concentrated CBD oils on the market, Zambeza 10% CBD oils never include pure CBD crystals or "isolates" that forfeit quality in favour of time and ease. In addition to providing customers with the highest concentrations of consistent CBD content, we are proud to include a full spectrum of terpenes - naturally occurring, aromatic compounds found in hemp that help to make CBD even more effective. At Zambeza, we strictly adhere to all regulations regarding CBD. Concerning our oils, we uphold transparent operations throughout every step of production. Our CBD oils are legal to purchase in most European countries. If you are unsure about the regulations in your country of origin, please consult your physician. 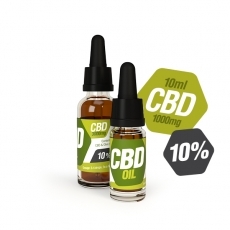 Consuming Zambeza 10% CBD oil is easy and discreet - our handy dropper bottles facilitate accurate dosing every time. Since our 10% variety is our strongest oil yet, we suggest taking 3-4 drops, 3 times a day at the start. Oils are easily consumed by dropping under the tongue or on top of meals. One you feel comfortable with your regimen, you can adjust your dosing as necessary. At Zambeza, we will never use preservatives to lengthen the shelf life of our products. For this reason, our 10% CBD oil is best stored in the refrigerator between uses.